Save the princess then save yourself! Click here to play! Beware the Twin Samurai, the strongest warriors in all of Asia, and escape the Forbidden City for massive cash payouts. 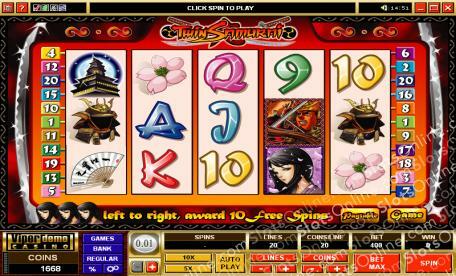 Twin Samurai is an exciting 5-reel game played across 20 pay lines, where the more lines activated will increase your payout odds on winning combinations. The Geisha is Scattered and can appear on any line, with payout odds up to 100:1. If you manage to spin up three or more of her from left to right you will also win 10 free spins! The Twin Samurai symbol is Wild and can be substituted for any other symbol on the reels except Scattered Geishas. The Temple is the best chance of a hideout, and if you manage to spin up all five on any active pay line you will find yourself with 5000 times your initial bet. The city is in peril, and you need to get out; escape the clutches of the Twin Samurai now! The Geisha is Scattered and can earn you up to 100 times your initial bet. If you manage to get three from left to right you will be rewarded with 10 free spins. The Twin Samurai symbol is Wild and can be substituted for any other symbol on the reels except Scatters.